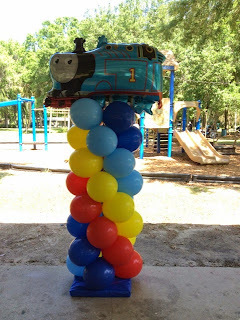 Party People created colorful columns on outdoor supports topped with Thomas the train foils for this very special 1st Birthday Celebration! Many times when clients contact us to provide balloons for their celebration - they first think of Helium balloons. The downfall of Helium balloons at an outdoor party is they can blow over, hit the ground and Pop! Wind can twist all the ribbon into a tangles mess! As a Professional Balloon Decor Company Party People loves to create Colorful Garland columns on outdoor supports that stay looking wonderful for your event! Call Party People, 1-800-752-3650 ext 2 to create custom decor for your special event in Central Florida.